The Ugandan government has charged a Catholic evangelist in the northern part of the country for giving false information to the BBC. The head of the country’s Anti Human Sacrifice and Trafficking Task Force, Moses Binoga, told the Ugandan daily New Vision that Pollino had confessed he lied about human sacrifice for monetary gains. “Pollino said the information he gave was baseless,” Binoga said. In a documentary by bbc journalist Tim Whewell, 60-year-old Pollino said he had sacrificed 70 people, including his son, during the 1980s and 1990s while he was working as a traditional healer. 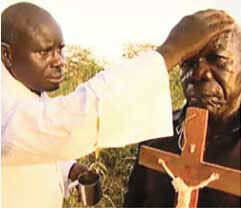 The documentary showed a group of traditional healers sacrificing people. Pollino alleged Whewell paid him US$ 100 to dramatize the story, a charge the journalist denies. Binoga said the British journalist is also under the scanner.